Everyone knows if you want an object to stay put, you zip it up. 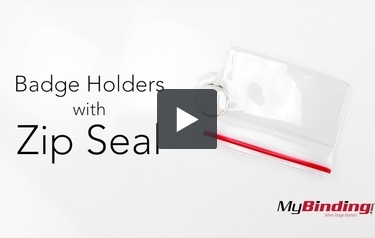 These badge holders combine a standard holder with the concept of a zip-lock bag to yield an innovative new way to display your ID or credentials. Secure zipping and sealing badges mean no lost documentation or badges. This seal is tight and secure. Options for placement are vertical and horizontal, and the always-loved and requested armband model. Credit card size, one of our most requested dimensions, is available for the quick and tight seal badges. Check them out below.